Struggling to find the right football mouthpiece for the 2019 season? In this buyer’s guide, we’ve reviewed 7 of the best football mouthguards on the market right now. We’ll also outline some key considerations when buying, and show you how to choose the right mouthpiece for your individual needs. Not sure which mouthpiece to pick? In this section we’ll walk you through the process of selecting the right mouthguard for football. Skip to our reviews if you know what you need. Simply put, some mouthguards are designed to protect your lips from debris, resulting in fewer cuts and scratches. The main downside to these mouthguards is they can inhibit your ability to speak easily. If it’s your job to be heard on the pitch, you’re probably better off getting a regular mouthpiece. Also, these types of mouthguards don’t normally allow you to create a custom mold, instead they come with generic areas for your teeth to grip. This isn’t necessarily a bad thing, some players like the simplicity of the bite pads. Some mouthguards can be molded to fit the specific layout, size and shape of your teeth. This is normally done with a “boil and bite” process. You put your new mouthpiece in a pot of boiling water for a specified amount of time, wait for it to cool a bit, and then bite into the soft plastic to form a mold. Mouthguards with lip protection generally use a pre-molded pad for your teeth to bite down on. You can’t make you own mold with these products. So what should you buy? It depends on whether you want the best possible level of comfort (a molded mouthguard) or better lip/mouth protection (a mouthguard with lip protection). 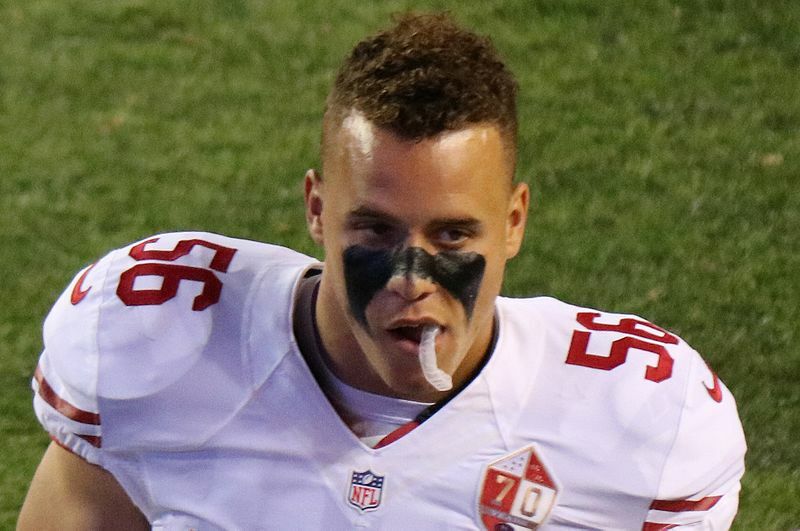 Shayne Skov using a boil-and-bite mouthguard. Image by Jeffrey Beall licensed under CC BY 4.0. 3. I Use Braces: Is This An Issue? Don’t worry: most mouthguards are designed to work with braces. Just make sure the seller specifies that the mouthpiece is compatible with your dental work. 4. What’s A Mouthguard Tether? Some players find that their mouthguards go missing easily (particularly the smaller ones without lip protection) during training sessions and games. Therefore, they use a tether which attaches their mouthguard to their helmet. Most mouthpieces come with a strap that can be attached and removed whenever you like. Remember that some leagues (particularly pee-wee tournaments) require the use of a tether. 5. What’s A Dental Warranty? The best mouthguards out there offer a dental warranty – usually up to a specific amount of money. What this means is that if you have your teeth damaged or knocked out – God forbid – while using the mouthguard, the company will reimburse you for a certain amount of money to cover the cost of the injury. These warranties cover very specific incidents and have pretty strict conditions. Click here to check out Shock Doctor’s warranty for one of their products. Although these deals are only valid in specific situations, it’s much better to have say a $10,000 dental warranty than a $5000 one. 6. Do I Need To Buy A Specific Mouthguard Size? Probably not. 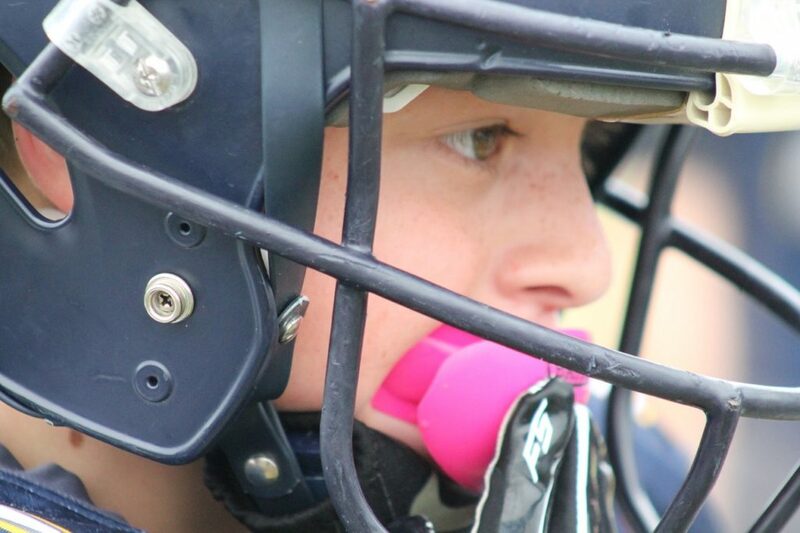 For the most part, football mouthguards come as one-size-fits-most. However, there are some mouthpieces that come in different sizes. For the most part this is simply “adult” (ages 12+) or “youth,” so it’s pretty easy to pick the right size. Choosing a mouthguard color is down to personal preference, unless your team requires your mouthpiece to match their kit. Some mouthguards also come with flavorings like bubble gum or strawberry. These flavors don’t tend to last long but they taste better than plastic, so try one out if you want. Now onto the reviews! In this section we’ll review 7 of the best football mouthguards for the money in 2019. If you’re looking for a mouthguard with lip protection, you’ll notice that most companies like to promote the breathability of their product. This is because the outer silicon material can obstruct your mouth when you’re using the mouthpiece. However, you’ll have no such problems with the Battle Oxygen mouthguard – its super-wide airway is large enough to allow for heavy breathing when you’re recovering from a sprint. This mouthpiece comes in a whole bunch of different colors and requires no boiling, so it’s suitable for those with sensitive gums. The price is fairly reasonable, and the company offers an unlimited guarantee against defects plus a $5000 dental warranty. It also works with braces. This is why the Battle Oxygen is one of the most popular mouthguards with lip protection – it’s a solid all-rounder which offers excellent value for money. Tons of colors & styles available. None to mention – solid all-round mouthpiece. 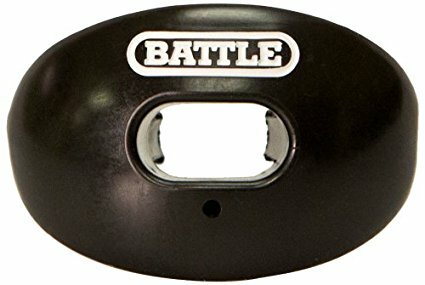 Battle’s Predator is the newer version of the classic Battle Oxygen mouthguard we just looked at. The difference between the two is the Predator has a much wider array of designs, including camo, jaws, and the Stars and Stripes. It’s also a bit more expensive than the older model. Apart from that, these mouthpieces are pretty much the same. With both products you get a $5000 dental warranty plus a guarantee against defects, and they both fit straight out of the box. If you don’t mind spending a few extra bucks for a more intimidating look on the pitch, the Predator is definitely worth it! But if you’re not bothered so much about how your mouthpiece looks, go for the regular Oxygen model. Massive range of styles & colors available. $5000 dental warranty + no defect guarantee. Shock Doctor’s take on the mouthguard + lip protection combo is quite similar to the Battle Oxygen products we just looked at. This mouthpiece doesn’t require boiling, and is made of medical-grade silicone. The difference is that Shock Doctor has opted for a different airway construction with this mouthpiece. Instead of having a single open airway, there’s a divider which creates dual channels for breathing. This feature can help to prevent your mouth becoming dry (from being open all the time) in cold conditions. The Max Airflow also comes with a $10,000 dental warranty and a detachable tether so you don’t lose it on the pitch. However, it doesn’t have a warranty against regular wear – this can be an issue because the bite pads can split if you tend to clench your teeth really hard. Not incredibly durable – no warranty against wear & tear. Now we’ll have a look at a few mouthguards that don’t include lip protection. These mouthpieces are great if you need to be vocal on the pitch, or if you find the bigger “pacifier” guards uncomfortable. Shock Doctor’s Pro model has a boil and bite function. Personally, I’m a huge fan of these mouthguards – I always used them as a kid. You simply boil some water, let it cool a bit, dip the mouthpiece in for 12 seconds and then bite the soft plastic. The end result is a mouthguard that fits almost perfectly, meaning less room for your teeth to move around upon impact. What’s more, this mouthpiece has a custom-designed bumper which protects your front teeth. This is particularly useful in football, where the majority of impacts (particularly for linemen) occur as you’re tackling someone standing in front of you. You can also choose whether to get a strapped or a strapless version, and the price is quite reasonable. Boil & bite – fits great. Front bumper – good level of protection. Unlike most other brands, Venum used rubber rather than silicon in producing this mouthpiece. As a result, it’s very comfortable to wear and molds easily when you boil and bite. The walls of this mouthguard are relatively thick but also quite tall, resulting in better protection for your front teeth in particular. Despite this, breathing and talking is a walk in the park. This is because the mouthguard was originally designed for use in martial arts, where athletes must inhale large volumes of air quickly due to the fact that fights only last a few minutes or so. Although it wasn’t designed with ball sports in mind (it doesn’t come with a strap), Venum’s product is great for football. The only downside would be the lack of a dental warranty. Thick, tall mouthguard wall offers great protection. If you’re looking for a super-comfy mouthguard but also need a strap, Oral Mart’s Cushion mouthguard is just what you need. Like the Venum Challenger we just reviewed, this mouthpiece comes with instructions to boil and bite, meaning it’ll fit your exact tooth profile, provided they all fit inside the mouthpiece. Unfortunately however, this mouthguard isn’t recommended for people with braces. As well as the tether, you also get a free case for your mouthguard. In addition, Oral Mart has a 100% satisfaction guarantee – the company promises to email you after your item has arrived to check in and see how it’s going. However, they don’t offer a dental warranty. Although there aren’t many colors available, the comfortable fit makes up for it – this is a great mouthguard for the price. Not recommended for use with braces. This mouthguard is only 2.4mm thick, and SISU say that their product is 30% lighter than regular mouthpieces. So, if you find other mouthguards to be uncomfortable, or hate how they make it hard to talk, it’s worth taking a look at the SISU Max. Since the mouthguard is reasonably thin, you might be concerned that it doesn’t offer much protection. However, SISU is confident enough in their product to offer a $35,000 limited dental warranty, so they’re sure it works. The company says that their custom “Diffusix” technology – a non-compressible, perforated material – will distribute shocks over a large area, resulting in less chance of dental injury. What’s more, this mouthguard is stylish, comfortable, and available in a lower-profile “Aero” model. You can pick from a range of different colors too. The only issue is how this mouthguard might affect your thought processes on the pitch. Even though the Max does offer decent protection, if you’re not 100% sure it’ll protect your teeth, you won’t be fully committed to the tackles you go for. This is why linemen wear bulky football gloves – so they’re certain that their hands are safe when tackling. If you’d feel more confident having a big, bulky mouthguard, it might be better to go for the Venum Challenger. Easy to mold – can be remolded too (boil & bite). Massive $35000 one-year dental warranty. The main decision you’ve got to make when selecting a mouthguard for football is this: do I want lip protection or not? You should also consider whether you want something you can boil and bite – the alternative is a “pacifier” model with lip protection and a generic bite pad. Plus, there’s the issue of whether you want a strap or not – in our opinion they’re a good thing to have. Still not sure which mouthpiece to buy? Let us know in the comments below and we’ll get right back to you!